in cartography, the ratio of the distance between two points on a map to the real distance between the two corresponding points portrayed. 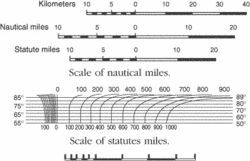 The scale may be expressed in three ways: numerically, as a ratio or a fraction, e.g., 1:100,000 or 1-100,000; verbally, e.g., "one inch to one mile" (not "one inch equals one mile"); and graphically, by marking distances on a sample line. The last method has the advantage that the scale remains true even if the map is enlarged or reduced mechanically. The first method is particularly useful since any unit of measurement may be used; e.g., if one uses metric units, a scale of 1:100,000 would mean that one centimeter on the map represents one kilometer on the earth's surface (since 100,000 centimeters equals one kilometer). The more the size of features on the map approaches the features' actual size on the earth's surface, the larger the scale of the map is said to be. A large-scale map usually shows more detail than does a small-scale map, but covers a smaller area than does a small-scale map of the same size. ..... Click the link for more information. relationship of each tonetone. ..... Click the link for more information. to the others upon which the composition depends. Scales further serve to classify and catalog the tonal material used in composition. ..... Click the link for more information. until the end of the 19th cent. The dissemination and influence of the diatonic scale was therefore very great. The minor scale is based on tsttstt. This arrangement produces the lower third, sixth, and seventh degrees that are characteristic of the minor mode; the higher seventh degree, a semitone rather than a whole tone below the main note, or "tonic," is often borrowed from the major mode for use at cadences. Akin to the modes, the concept of keykey. methods for assigning pitches to the twelve Western pitch names that constitute the octave. The term usually refers to this procedure in the tuning of keyboard instruments. in music, the altering of certain intervals from their acoustically correct values to provide a system of tuning whereby music can move from key to key without unacceptably impure sonorities. ..... Click the link for more information. had become established. The resulting scale, called chromatic, consisted of 12 notes divided by semitone intervals (the white and black notes of the keyboard). Although the diatonic scale is basically heptatonic (seven-noted), music that is in a major or minor tonality usually employs the remaining five tones of the chromatic scale as auxiliary or ornamental tones. Music that employs them freely is said to be highly chromatic, while music that employs them sparingly is said to be diatonic. The chief characteristics of Arabian music are modal homophony, florid ornamentation, and modal rhythm. ..... Click the link for more information. and Hindu musicHindu music. The music of India is entirely monodic. To Westerners it is the most accessible of all Asian musical cultures. Its tonal system divides the octave into 22 segments called srutis, not all equal but each roughly equal to one quarter of a whole tone of Western music. See N. Slonimsky, Thesaurus of Scales and Melodic Patterns (1947); C. Sachs, The Wellsprings of Music (1965). instrument used in laboratories and pharmacies to measure the mass or weight of a body. A balance functions by measuring the force of gravity that the earth exerts on an object, i.e., its weight. ..... Click the link for more information. . Platform scales utilize a succession of multiplying levers that transmit the weight to a beam or other registration device. They are used where massive objects or large quantities are to be weighed. For example, a railway car or truck moves onto a platform scale before and after unloading or loading, in each case the difference between the weighings being the weight of its cargo. As the name implies, counter scales are used in commercial establishments where weighing can be most conveniently done on a counter. Cylinder, drum, or barrel scales show their calibrations on a rotatable chart. These find wide use because of the ease with which the cost of a given weight may be read from them through the juxtaposition of fixed and rotating charts. The same purpose is served by the fan-type scale, in which an indicator moves through an arc marked from zero to the maximum capacity of the scale. Both the indicator and the fan expanse are calibrated for automatic computation. A great variety of scales are specially constructed for industrial uses in which weighing of a continuous flow of material is required. The scale in such cases is part of the machinery that carries the weighed material to a succeeding operation. Many scales provide printed records of each reading, and some keep a cumulative registration of a succession of readings. in zoology, an outgrowth, either bony or horny, of the skin of an animal. The major component of the scales of fishes is bone, and they are formed directly in the skin membrane as the fish grows. The number of rows of scales, as well as the kind, figures in the identification of a species. The growth of the scales is marked by rings, which aid in determining the age of the fish. The placoid scales of sharks, which have a dentine base with a pulp cavity, are thought to be similar to the forms from which the teeth of the higher vertebrates evolved. Ganoid scales, found in primitive fishes such as the gar pike and the sturgeon, are heavy and platelike. Other fishes have either rough scales (ctenoid) with comblike edges or smooth scales (cycloid). The horny scales, or scutes, of most reptiles develop embryologically as outpushings of the epidermis. In some lizards the scales are modified to form tubercles or granules. Other lizards and snakes have overlapping scales, highly developed in the snakes as aids to locomotion. The crocodile has both horny and bony scales. Among turtles and their relatives scales are usually found on the head, neck, limbs, and tail; in most of the group horny scales also form a pattern of flat plates overlying the bony dermal skeleton of the back and belly. Birds have horny scales on the feet and sometimes on the legs. Some mammals, e.g., the mouse and the rat, have scales on the tail; the pangolin and the armadillo have a body covering of large horny scales. The relationship of one part of an object to an outside measure, such as a human body or some standard reference; a system of representing or reproducing objects in a different size proportionately in every part. The size or proportion of a building element or space, or article of furniture; relative to the structural or functional dimensions of the human body. Impressively large, sturdy and enduring. Not related to the scale of the human body. a series of musical sounds, that is, a consistent sequence of sounds (steps) of a given mode, which are arranged in ascending or descending order from the base tone. The scale spans one octave but can be extended up or down the adjoining octaves. The scale designates the structure of the mode and the pitch relationships of the scale’s steps. A distinction is made between the seven-tone scale of diatonic modes, the five-tone scale of anhemitonic (without half steps) modes, and the 12-tone chromatic scale. Executing the various scales and their combinations helps develop the musical technique of instrumentalists and singers. in architecture, the relationship between various dimensions of buildings, structures, and organized space and, in turn, their relationship to the human viewer. Scale not only impresses the viewer with a notion of the size of a building or architectural complex, which may or may not be accurate, but also creates a mood. Architectural scale is the result of the total interaction of the dimensions underlying every element of a composition as seen by the viewer. For example, visual measurement units of the wall of a house may be bricks, dressed stone (of which the wall or the wall covering is composed), blocks, panels, or the entire wall (if it is not divided into sections). An important role in the creation of a sense of scale is played by the major visible structural elements, which provide a particularly graphic idea of the building’s dimensions. An architect can achieve diversified artistic effects by moving or setting apart the supports, by changing the height of the girders or the archivolts in relation to the bay, and by relating these changes to the dimensions and sections of the building’s other elements. The apparent scale of an architectural work can sometimes be affected by the distance from which it is seen. For example, a building that gives the impression of being large from a remote vantage point (or on a drawing), may seem substantially smaller when approached by the viewer, who is then able to see the actual dimensions of the construction in relation to himself. The architectural scale of a building as a whole is related to its surroundings (the local terrain, the urban environment) and changes with them. Construction on a grand scale is primarily used to impart particular significance to an architectural work. For example, ancient Greek temples, with their heroic scale, seem to have been designed for epic heroes. The large-scale amphitheaters, aqueducts, and basilicas of ancient Rome, as well as the civic structures in the Russian Empire style, reflect the power of the states that built them. Grandiosity of scale, combined with the large dimensions of the structures, has an oppressive effect on people, making them feel insignificant (for example, the religious Structures of ancient Egypt). The scale of an architectural work reflects socio-historical conditions and the outlook of a particular era, as well as the social position of the person who ordered its construction. As with the structural forms, the scale of an architectural work is an effective artistic device, creating an image that is understood and felt not only by contemporaries but also by future societies and other cultures. Burov, A. K. Ob arkhitekture. Moscow, 1960. Kirillova, L. I. Masshtabnost’ v arkhitekture. Moscow, 1961. Vseobshchaia istoriia arkhitektury, vol. 2. Moscow, 1973. Pages 251-60. Nobbs, P. E. Design: A Treatise on the Discovery of Form. London-New York, 1937. Licklider, H. Architectural Scale. London, 1965.
the ratio of the length of segments on a drawing, plan, aerial photograph, or map to the actual physical length of the segments corresponding to them. The fractional scale thus defined is an abstract number, which is greater than 1 in cases of drawings of small machines and instrument parts, as well as many microscopic objects, but less than 1 in other cases, where the denominator of the fraction (with a numerator equal to 1) shows the degree of reduction in the sizes of the images of the objects relative to their actual dimensions. The scale of plans and topographical maps is constant; that of geographic maps is variable. The graphic scale—that is, a straight line divided into equal segments with notations that indicate the actual physical lengths of the segments corresponding to them—is important in practice. A “transversal” scale is constructed for more precise recording and measurement of lines on maps. A transversal scale is a graphic scale parallel to which are drawn a number of equidistant horizontal lines that are intersected by perpendicular (vertical) and diagonal (transverse) lines. The principles of construction and use of a transversal scale are clear from Figure 1, which shows a fractional scale of 1:5,000. The segment of the transversal scale marked in the figure by the two dots corresponds to a line on the terrain of 200 + 60 + 6 = 266 m. The term “transversal scale” is also used for a metal ruler on which a representation of such a drawing has been inscribed with very fine lines, sometimes with no markings. This makes it easy to use for any fractional scale. Inzhenernaia geodeziia. Editor in chief, P. S. Zakatov. Moscow, 1969. Chebotarev, A. S. Geodeziia, 2nd ed., part 1. Moscow, 1955.
solid deposits that form on the interior walls of the pipes of boilers, water economizers, steam superheaters, evaporators, and other heat-exchange devices in which water containing various salts is heated or evaporated. The most common types of scale, in terms of chemical composition, are carbonate (calcium and magnesium carbonates, CaCO3 and MgCO3), sulfate (CaSO4), and silicate (silicates of calcium, magnesium, iron, and aluminum). The heat conductivity of scale is tens of times—and frequently hundreds of times —less than that of the steel of which heat exchangers are made. For this reason, even very thin films of scale give rise to high thermal resistance and may lead to such overheating of the boiler tubes that flaws and bulges are formed, frequently leading to rupture of the tubes. Scale formation is prevented by chemical treatment of the water that enters the boilers or heat exchangers. Scale is removed by mechanical and chemical means. Examples of scale are the solid deposits formed inside of teakettles and samovars. the product that results when the surface of a metal oxidizes upon reaction with the environment. Usually, scale includes only the oxidation products of iron and iron alloys. In a broader sense, however, it also includes the products of other oxidizing agents on the surface of a metal, for example, sulfur and nitrogen. Thin layers of scale, often called oxide films, are transparent for thicknesses up to 40 nanometers (nm) and are to some extent colored for thicknesses from 40 to 500 nm. For thicknesses greater than 500 nm, scale has a permanent color that depends on its chemical composition. (1) A microscopic chitinous plate on the bodies of some arthropods, mainly insects, which sometimes completely covers the body. As a result of their optical properties, the scales as a rule determine the coloration of the animal. Butterflies have scales which are particularly developed. Bristletails, springtails, weevils, mosquitoes, and some Hymenoptera have scales, as well as some mites. (2) Various growths on plants, usually flat and having a protective function. Frequently “scale” refers to the base of a leaf that remains on the stalk after the leaf has fallen off and that forms a peculiar shell on the stem. (also plate), a hard metameric protective plate of the epidermis in vertebrates, including fish, reptiles, birds, and some mammals. The scales of fossil Agnatha and fossil fishes were mesodermal in origin and were formed by bony tissue (dentin, bone). Scales are distributed on the body in regular diagonal rows in the direction of the collagen fibers of the skin. In addition to their protective function, they fulfill musculoskeletal functions. In the phylogenesis of the lowest, originally aquatic, vertebrates, such as cyclostomes, fishes, and amphibians, the origin of the scales is the placoid scales of fossil Thelodontidae and cartilaginous fishes, as represented by dentin spines and teeth that were periodically replaced as the animal grew (seePLACOID SCALE). The cosmoid scales, ganoid scales, cycloid scales, and ctenoid scales of the bony fishes are complex phylogenetic derivatives of the original type of scale (seeCOSMOID SCALE; GANOID SCALE; CYCLOID SCALE; and CTENOID SCALE). These scales are characterized by cyclical growth and the formation of annual rings, which make it possible to determine the age of the fish. Among amphibians, bony plates similar to fish scales are found in some stegocephalians and modern Apoda, such as the Caeciliidae, including water snakes. The horny plates of reptiles, birds, and some mammals are formed by the keratinization of the outermost epidermal layer. They prevent the skin from drying out and protect it from physical damage. The horny plates are usually replaced through periodic molting or desquamation. In certain reptiles, such as crocodiles and tortoises, the horny plates sometimes fuse with the secondary dermal ossifications and cover the entire body. In birds they cover only the legs, and in mammals, for example, marsupials, rodents, insectivores, and some others, they are usually found on the tail. The secondary development of large plates on the body is observed in armadillos, in which they overlie bony plates, and in pangolins. part of the reading device of a measuring instrument, consisting of a system of markings (dots or lines arranged in some definite sequence) with numbers or other symbols at some of the markings representing a series of consecutive values of the measured quantity. Scale parameters, such as scale limits and the value of a division of the scale (that is, the difference between scale values corresponding to two adjacent markings), depend on the inherent measurement limits of the measuring mechanism, on the sensitivity of the instrument, and on the required reading precision. The arrangement of the divisions, which can be in a circle, an arc, or a straight line, depends on the design of the reading device, while the scale itself may be uniform, quadratic, logarithmic, and so on. The main divisions of the scale, corresponding to the numerical values, are marked off by longer or thicker lines. Readings are made by the naked eye on scales the distance between whose divisions is 0.7 mm or higher; smaller intervals require the use of a magnifying glass or microscope. Fractional estimates of scale divisions are made with the aid of verniers. A series of musical notes arranged from low to high by a specified scheme of intervals suitable for musical purposes. The bract of a catkin. A series of markings used for reading the value of a quantity or setting. To change the magnitude of a variable in a uniform way, as by multiplying or dividing by a constant factor, or the ratio of the real thing's magnitude to the magnitude of the model or analog of the model. A ruler or other measuring stick. A dense deposit bonded on the surface of a tube in a heat exchanger or on the surface of an evaporating device. An indication of represented to actual distances on a map, chart, or drawing. A thick metallic oxide coating formed usually by heating metals in air. A one-to-one correspondence between numbers and the value of some physical quantity, such as the centigrade or Kelvin temperature scales on the API (American Petroleum Institute) or Baumé scales of specific gravity. To determine a quantity at some order of magnitude by using data or relationships which are known to be valid at other (usually lower) orders of magnitude. A flat calcified or cornified platelike structure on the skin of most fishes and of some tetrapods. 1. The product resulting from the corrosion of metals. 2. A heavy oxide coating on copper and copper alloys resulting from exposure to high temperatures in an oxidizing atmosphere. 3. In drawing, a measuring instrument with graduated spaces. 4. A system of proportion by which definite magnitudes represent defined larger magnitudes, as on a map or drawing. 6. The outer covering of a casing. 7.See architect’s scale, engineer’s scale. 8. The crust on the inner surfaces of boilers, hot water heaters, and pipes formed by deposits of silica and other contaminants in water. Scale as it is indicated on maps and charts. The scale of a photograph. The ratio between a distance on a map, a photograph, or a chart and the corresponding ground distance. The scale is represented by a representative fraction (e.g., 1/500,000, 1 in 500,000, or 1:5,000,000), by a plain statement (e.g., “1 in to a mile” or simply “1 in”), or by a graduated scale given at the bottom of a map or a chart. 5. a graded series of tests measuring mental development, etc. (1) To resize a device, object or system. With regard to increases, "scale vertically" or "scale up" refers to expanding a single machine's capability. To "scale horizontally" or "scale out" refers to adding more machines.